Sometimes I go through my “Haven’t blogged yet” folder and I can’t believe some of the images that I haven’t blogged yet! Like this one! It was one of the first I captured this season and I love it because of the unique perspective. I just happened to be walking around the Tidal Basin by myself when I noticed a group of people taking selfies. They looked like they were having fun so I didn’t want to interrupt them by walking past and being in the background of their shot. So I stood there a little while until they were done. But that’s when I noticed that to the right of them was a straight shot of the Martin Luther King Jr Memorial statue. Now that I think of it, I don’t know if they were capturing the memorial or the cherry blossoms in the background but the sun had just come up a little and the light was shining very nicely on the memorial and the trees surrounding it. It was like the beacon in the middle of cherry blossom trees and just screaming for me to capture it. I probably spent a good 10 minutes just standing there trying to get this shot how I wanted it. It took longer because there were floating heads in some shots from people walking in front of my lens but it was totally worth it. I feel like the lighting and the framing worked so well to bring attention to the distant memorial. I’m actually surprised because it doesn’t even look like there’s that many people in front of the memorial. Usually there are wayyyy more people during cherry blossom season. My camera settings for this image is F5.6 at 1/640th sec and ISO 1600 with my Sony A7II and 70-200mm zoom lens. I know I’ve mentioned it before, but I’m also a fan of when the cherry blossoms start falling. I think it adds a lot of interest when there is pink the trees but also pink in the grass. I captured this when the petals first started falling. It was the first day of rain after a week of blue skies and I wasn’t mad about it. It ended up being a peaceful day at the Tidal Basin that allowed me to get a little creative with the petals. Luckily, there weren’t as many people out taking pictures so I had time to try different things without worrying about being in other people’s way. Trust me when I say that the Tidal Basin can get PACKED. Like tripod legs within tripod legs. It’s bananas. So a day without that many people is so freeing. This image was almost by accident. I wanted to photograph the petals in the water, but I accidentally left my camera settings as the same as I was shooting when I was photographing the trees. Obviously, pointing up towards the sky allowed a lot more light coming in than pointing down into the water. So when I expected this image to turn out crisp and clear, it turned out a little blurry. But in such an interesting way that I tried a couple of different compositions until I came out with this one. The water was particularly choppy because of the rain so each time I clicked, I came out with something completely different. It was fun turning my camera in different angles to try something new. 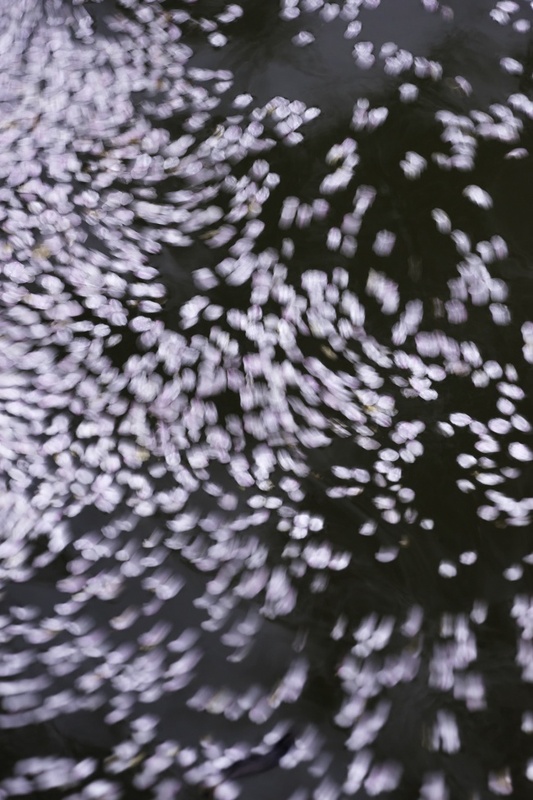 In the end, it’s the circular motion of these petals that really makes the image more interesting to me. My camera settings for this image is F11 at 1/8th sec and ISO 2000 with my Sony A7II and 70-200mm zoom. 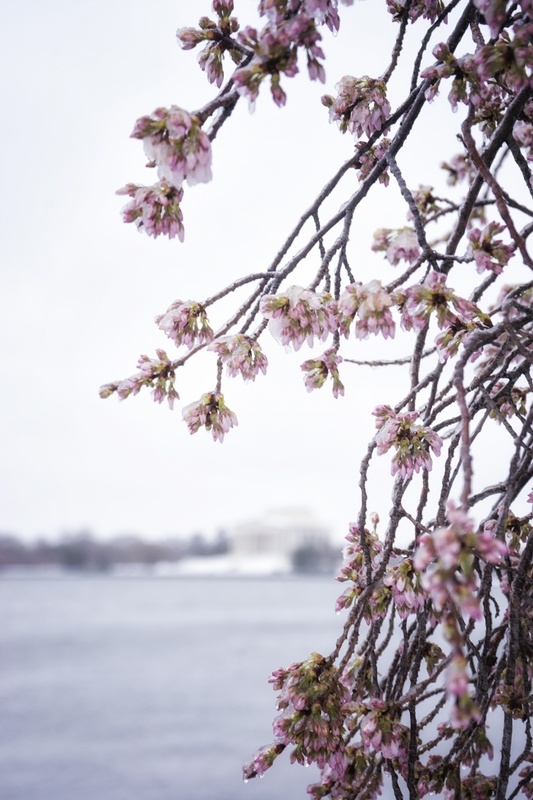 Unfortunately, the cherry blossoms around the Tidal Basin have pretty much lost all their flowers. Whenever that happens it sort of feels like the official end to cherry blossom season but I’m not sad about it. It’s expected for the cherry blossoms to last about a week-ish but there was something very special about this year’s bloom. They seemed to be puffier and more colorful than ever. We had beautiful weather the entire week with nothing but blue skies. It was so exciting to capture. And it seemed like there were so many more photographers out because of the beautiful weather. This image was actually captured 2 weeks ago, my first official day of photographing the trees this year. I got to the Tidal Basin a little bit earlier than my usual time. I say I’d got there around 6:20a and it was ALREADY PACKED! I couldn’t find a parking anywhere spot along Ohio Dr at all. In my head, I thought that since it was Monday and that I was there earlier than I usually am, I should be fine with parking, but I was totally wrong. I ended up parking closer to the Smithsonian museums along the National Mall. 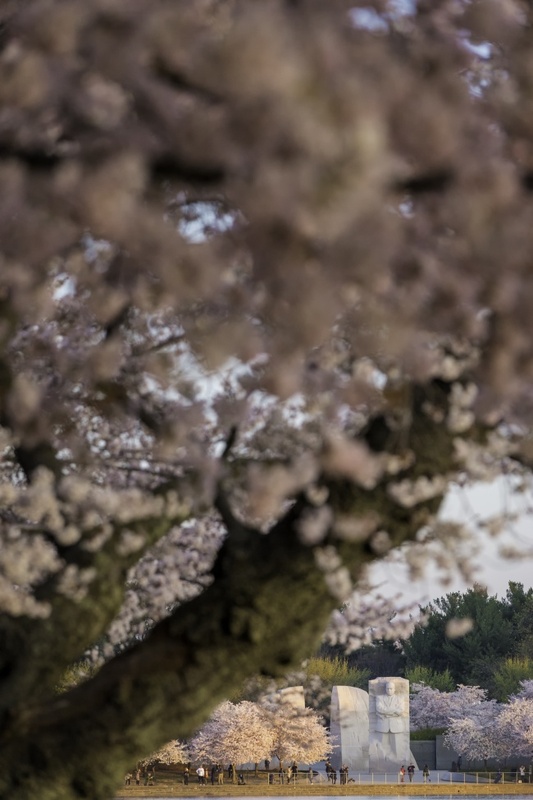 It was all good though because I was able to capture some of the cherry blossom trees by the Washington Monument on my walks to and from the Tidal Basin. This one was taken on my way back to the car. 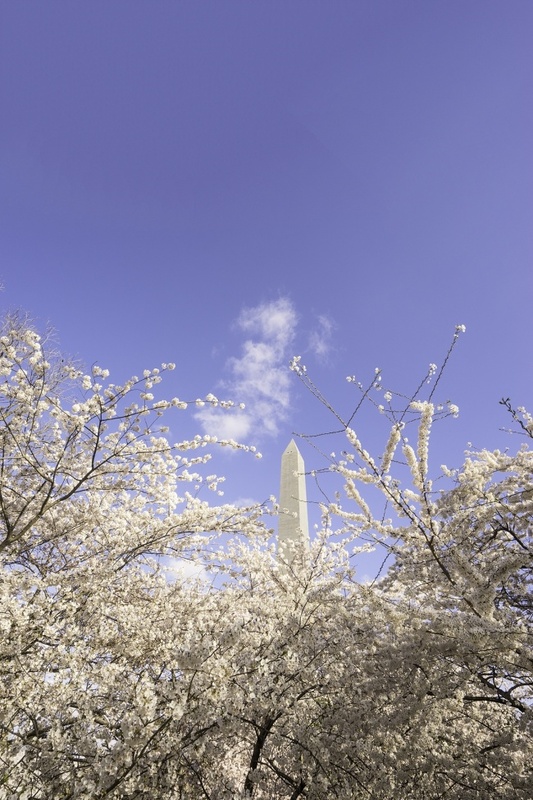 The sun had been out for quite some time but I just loved the cherry blossom trees looked like they were about to engulf the Washington Monument. I think that little bit of cloud adds a nice touch to the framing as well. My camera settings for this image is F7.1 at 1/640th sec and ISO 250 with my Sony A7II and 16-35mm wide angle. I saw the lady in Japanese pink komono. She was walking around with this weird looking umbrella and it immediately got my attention. I mean there is no way that umbrella can protect you from rain, sun or anything. It’s really just there for decoration right? What is she going doing with that? Then I noticed the man following behind her and it all made sense. So between the cherry blossom tree trunk I was watching (stalking) this group of people as they walked towards the Japanese Pagoda. I usually like to mind my own business, especially when it comes to other people and their photoshoots but there was something about this one that I couldn’t ignore. Maybe it was the weird umbrella but it could have also been the perfect light and environment for this photoshoot. 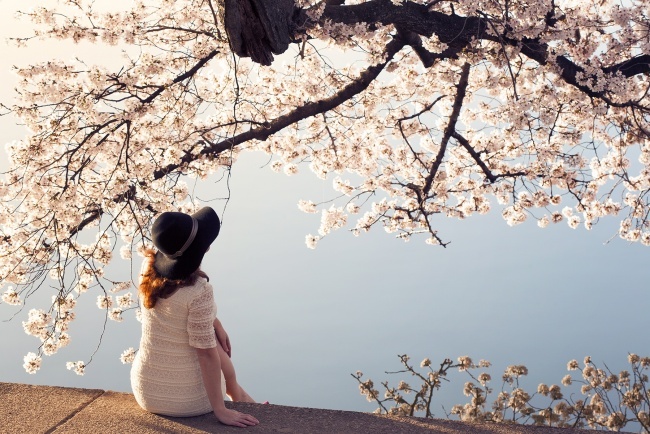 I mean how could you go wrong with such a pretty outfit during peak bloom of the cherry blossoms at sunrise? It was something I could not pass up. My favorite part about this image is the out of focus cherry blossom branch right in the front of the image. I think it just creates so much more depth to the image that would have been difficult to communicate if it were in focus. I don’t know why but I love looking at that one branch. My second favorite part of this image is the photographer in the mid-squat. LOL. I know I’m guilty of this stance. Sometimes you just need to get a little bit lower to get the shot and he is doing it perfectly. LOL. I would love to see how that image turned out but I probably never will. My camera settings for this image is F5.0 at 1/100th of a second at ISO 400 with my Sony A7II and 16-35mm wide angle lens. An image that didn’t make the 2018 Dynamic DC Wall Calendar cut. I think my favorite part of the image is the little reflection you see on the bottom right hand corner. It’s definietly obvious that it’s there, but the reflection is so subtle that I don’t know if you really think about it. I like how it gives the vibe that she’s being surrounded by cherry blossoms. To be honest, I don’t even know how this lady is. 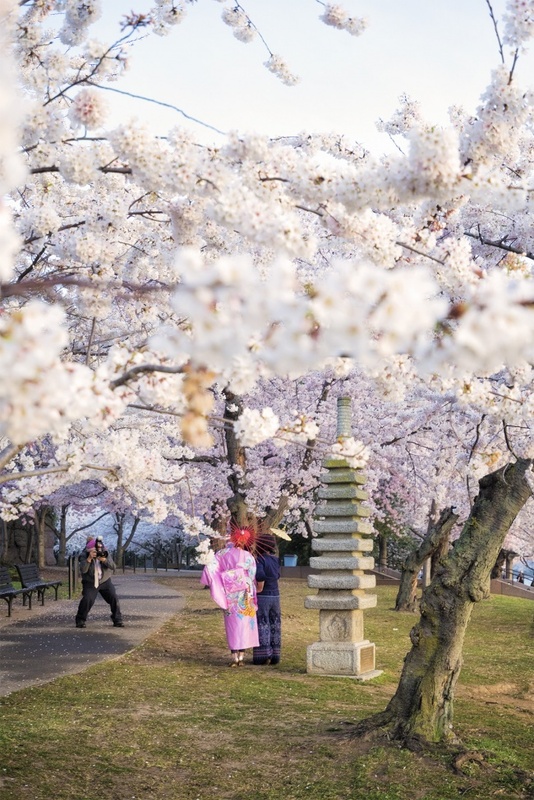 She was just there with another photographer and they were having a cherry blossom photoshoot. Totally normal if you’re ever at the Tidal Basin during cherry blossom season. I usually try to stay out of the way and I was in the middle of walking around them when I saw the scene from behind. Now, I don’t know how this lady’s photographer’s image turned out, but I’m really happy with mine. But even if she walked right past me, I would not even be able to recognize her. I completely forgot what she looked like from the front. She will now forever be called ‘Cherry Blossom lady’ to me. HAHA. But if I did find out who she was, I’d totally gift her with this print. The settings for this image is 1/100th of a second at F/8 and ISO 160 with my 100mm macro lens. See, you can go beyond just macro images with that lens however I’m not sure why I did that. I was probably busy shooting the flowers and just happened to have that lens on my camera. First of all, I just wanted to say thank you sooooooo much to everyone who commented, left messages or called me yesterday. You all really know how to make me feel special. I had the best day with Andrew yesterday in New York. If you follow me on instagram, you may have seen a little bit of it on my stories. So thank you, thank you, thank you. I am just so happy right now. And to completely flip the script, remember when this was like the worst day ever?! This past winter was so nice and mild. I really thought we were going to get away with no snow at all. But March hit, all the flowers started budding/blooming and BAMN winter snow storm Stella. I’m still shaking my head as I’m writing this. Man, I was so worried that this snow storm was going to effect the cherry blossoms. I mean look at them in this picture! Don’t they look so sad and cold. I’d never seen anything like it at the Tidal Basin. But as my friend, Bob Marley would say “Don’t worry about a thing, cuz every little thing is going to be all right”. And it did! It ended up being the best cherry blossom season I had experienced! The weather was absolutely perfect after the storm went away and a lot more of the cherry blossoms survived than expected. And don’t get me started on that one day we had fog! Holy Crap! The best part was that since a lot of people thought the cherry blossoms weren’t going to make it, the tidal basin was definietly not as crowded. It was just so freeing! Ahh I’m so happy just thinking about it. And I’m happy that it was my birthday.